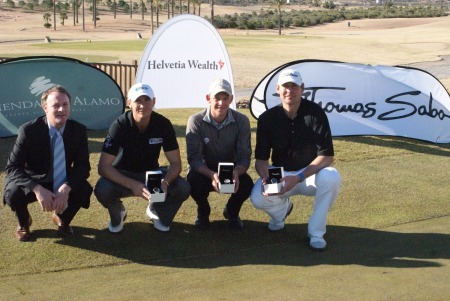 Wayne Hachey, Lloyd Saltman, Joachim Hansen and James Hepworth at Hacienda del AlamoGareth Shaw tied for fourth place with suspended European Tour player Elliot Saltman in the Hi5 Pro Tour’s Hacienda del Alamo Open in Spain. 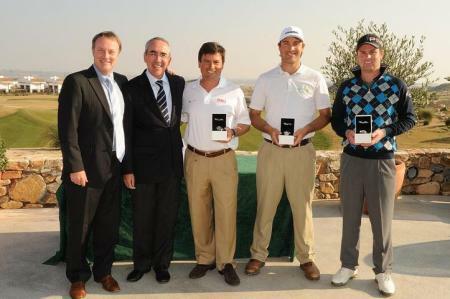 Saltman’s brother Lloyd cruised to an emphatic 13-stroke win on 21 under par when he closed with an eagle two at the 16th and an eagle three at the last for a final round 66 in the 54-hole mini tour event in Murcia. 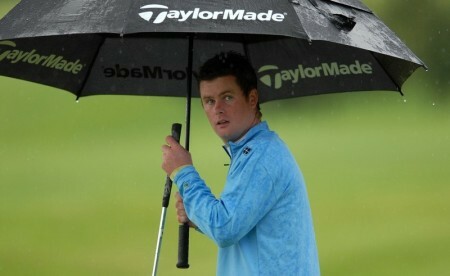 The Scot’s brother Elliot, who was handed a three month ban by the European Tour 16 days ago for a “serious breach” of the rules in a Challenge Tour event in Russia last September, shot a third round 69 to finished level with Shaw (71) and Spain’s Carlos Balsameda (69) on seven under. England’s James Hepworth (69) and Dane Joachim Hansen (68) finished joint second on eight under par as Lloyd Saltman won a watch and a cheque for €3,900. Elliot Saltman was accused by both of his playing partners of not replacing his ball-marker correctly on a number of occasions in the M2M Russian Challenge Cup at Tseleevo Golf and Polo Club near Moscow. A statement from the European Tour read: “The committee unanimously found that Elliot Saltman had committed a serious breach of the 2010 Challenge Tour Members Regulations during the first round of the Russian Challenge Cup. “It was the finding of the Tournament Committee that Elliot Saltman, who was disqualified from the Russian Challenge Cup, be suspended from participating in all European Tour and Challenge Tour sanctioned tournaments for a period of three months, starting on 19 January, 2011. Clandeboye’s Jonny Caldwell shot 79 to finished tied 35th on four over with Castle’s Dara Lernihan’s 74 leaving him two shots further back in tied 37th. 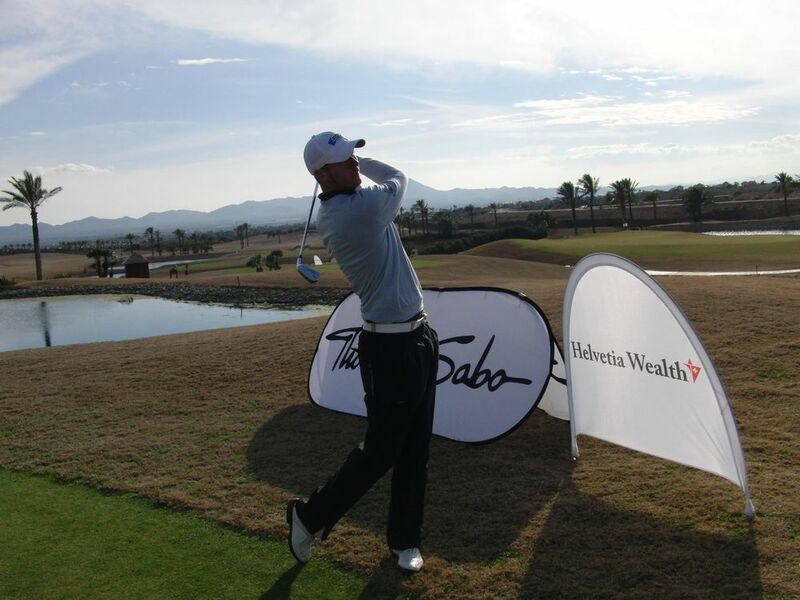 Lloyd SaltmanThe efforts of the Irish contingent were completely overshadowed by the Saltman bothers, Lloyd and Elliot, following the opening round of the Hi5 Pro Tour’s Hacienda del Alamo Open. Scotland’s Lloyd Saltman leads in SpainLurgan’s Gareth Shaw fired a six under par 66 but still found himself nine strokes adrift of runaway leader Lloyd Saltman entering the final round of the Hi5 Pro Tour’s Hacienda del Alamo Open. World No 1 Lee Westwood believes Elliot Saltman should not have been allowed to tee it up on the Hi5 Pro Tour in Spain last week. Clandeboye’s Jonny Caldwell fired five birdies and a bogey in an opening 67 to lead the Irish contingent after the opening round of the Hi5 Pro Tour’s El Valle Open in Murcia. L-R Wayne Hachey, Paco Sardina, Miguel Martin, Florian Fritsch, Jonathan Caldwell. Photo Jos Linckens www.golfsupport.nlAs Martin Kaymer giving Tiger Woods a taste of things to come in the Dubai Desert Classic, the German’s former foursomes partner Florian Fritsch was scorching to a nine-under par 62 to win the El Valle Open on the slightly less glamorous Hi5 Pro Tour in Spain. 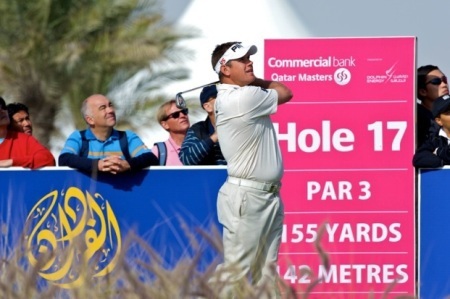 Fritsch triumphed by a stroke from overnight leader Miguel Angel Martin (73) and Clandeboye’s Jonny Caldwell (70), who birdied his final three holes to finish alongside the Spaniard on 10 under par.